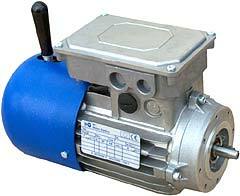 Brake motors are made with the application of an electromagnetic disc-brake onto an A.C. motor which operates in case of lack of current causing the blocking of the motor and of the other devices connected to it. The brake motor grants a high stop precision in case of voluntary interruption of current; it grants also a high safety margin should the interruption be accidental. Braking pressure is effected in a very fast way from one or more springs once the electromagnet stops its action. possibility of brake separate feeding. This solution is advisable on two speed motors and when an inverter is used.